Any quantity only $7.99 per oz over spot! If you want to buy silver from the Royal Mint of England, you have a lot of options to choose from when shopping. In addition to its brilliant collections such as the bullion Britannia coins and the collectible Queen’s Beasts, the Royal Mint has a beautiful silver series featuring iconic landmarks from across London. Right now, the 2017 1 oz Silver British Landmarks of Britain Big Ben Coin is available to purchase online at Silver.com. Ships to you inside of a protective plastic capsule with 20 arriving in a sealed roll! First coin design released in the Royal Mint’s Landmarks of Britain series! Mintage limited to 50,000 coins only! Bears a face value of £2 (GBP) backed by the government of Great Britain. 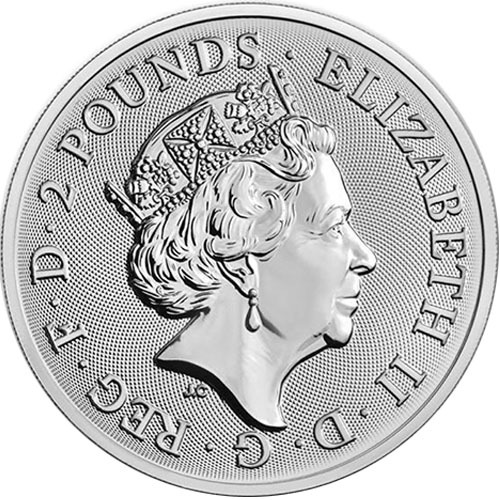 On the obverse face is a depiction of Queen Elizabeth II. The reverse side of the coins bears the outer façade of Elizabeth Tower and Big Ben. Landmarks of Britain artwork from Laura Clancy and Glyn Davies. Each of the 2017 1 oz Silver British Landmarks of Britain Big Ben Coins available to you in this listing represents the debut issue of the new four-coin series known as the Landmarks of Britain. Each individual coin arrives inside of a protective plastic capsule. The designs in this series are the work of artists Laura Clancy and Glyn Davies. Originally known simply as the Clock Tower, Elizabeth Tower was renamed in 2012 in honor of Queen Elizabeth II during the years of her diamond jubilee on the throne of England. The tower is at the north end of the Palace of Westminster in London and juts out into the sky from the building occupied by the Houses of Parliament. 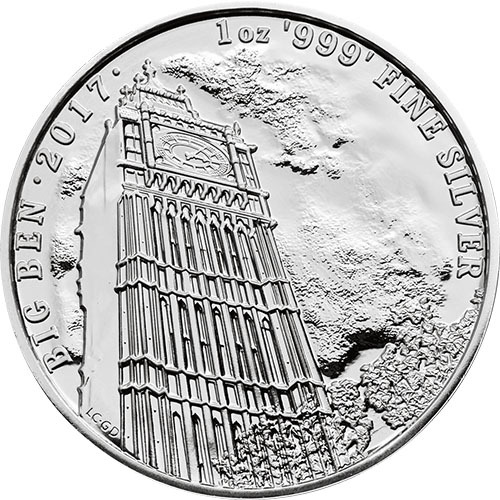 On the reverse of the 2017 1 oz Silver British Landmarks of Britain Big Ben Coin is the image of Elizabeth Tower. As you gaze up at the tower from the ground you can see its well-known clock face which hides a series of five bells inside. The largest of these bells is known as Big Ben and is named after Sir Benjamin Hall, the man who oversaw its installation. The obverse of the 2017 Silver British Landmarks of Britain Big Ben Coins includes the right-profile portrait of Queen Elizabeth II. Reigning over England since 1952, Elizabeth II now has the longest reign of any British monarch and is featured here in a definitive fifth-generation portrait created by Royal Mint engraver Jody Clark. If you have any questions, please feel free to contact Silver.com. Our customer service team is available to you at 888-989-7223, online using our live chat, and via our email address.